The Art Gallery of Windsor, first established on October 1, 1943 and incorporated in 1944, is located in Windsor, Ontario. Primarily serving the residents of southwestern Ontario, the gallery has an extensive collection of nearly 4000 works of art. In 1943, the Art Gallery of Windsor operated out of Willistead Manor, primarily showcasing collections and exhibitions from other galleries. It was not until 1944 that the Art Gallery of Windsor was incorporated by the province, at which time it began to establish its own collections. The Art Gallery of Windsor has been located in a variety of buildings over the years. In 1975, the gallery operated out of a renovated warehouse. The gallery also spent some time at Devonshire Mall in Windsor, before it was moved to its current location on Riverside Drive. 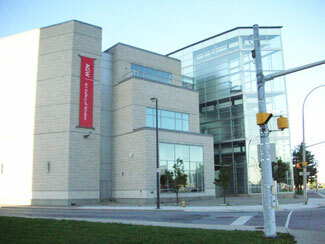 Many of the 4000 works of art displayed at the Art Gallery of Windsor are Canadian. The gallery showcases a variety of works of art, including paintings, photographs, sculptures, and drawings in a variety of artistic styles. The exhibitions also change frequently. The Art Gallery of Windsor is currently celebrating 75 years with the exhibition, Look Again! The AGW Collection at 75 Years. Art Gallery of Windsor. (1959—2001). Annual Report: Art Gallery of Windsor. Windsor, ON: Art Gallery of Windsor. Art Gallery of Windsor. (1988). Art Gallery of Windsor, Winter 1988. Windsor, ON. : Art Gallery of Windsor. Art Gallery of Windsor. (n.d.). Current Exhibitions: Look Again! The AGW Collection at 75 Years. Art Gallery of Windsor. (n.d.). About the AGW. Art Gallery of Windsor. (n.d.). Collection. Canadian Encyclopedia. (2006, February 7). The Art Gallery of Windsor. Craig Pearson., E. W. (2000, Aug 23). New gallery to open with Van Gogh, Renoir, Monet. The Windsor Star. Cultural Engines. (n.d). AGW Beginnings. Windsor Public Library. Schmidt, Doug. (2018, Feb 16). Empowering art that stares you in the face, urges you to reflect. The Windsor Star.